Windmills and waterways along with tulips and cheeses typify the Netherlands, and an ideal time to enjoy them all is coming at the end of this week (although as the editor points out, the Dutch flower season stretches well into the summer). Access will be free to some 950 mills – some working – during National Windmill weekend, 13-14 May, while the world’s finest flower-garden, Keukenhof, remains open for a further two days. This blaze of colour draws 800,000 annual visitors to Lisse in south Holland, which also has the biggest concentration of draining mills as well as the unique Falcon in Leyden, mostly overlooking canals and rivers linked to the North Sea. Yet the province’s western part is usually called the land of sand-dunes and bulb-fields. All these attractions can be reached within an hour from the lively resort of Katwijk aan Zee that is old enough to have a Roman lighthouse. Fishermen’s cottages are a reminder that it once had the largest herring fleet in the Netherlands, and the local museum has the best fisheries exhibition on the coast. Katwijk Museum also has a wide collection of seascapes and other paintings, because the resort has long attracted artists. The studio is on the promenade behind dunes through which are paved paths to one of the largest beaches on the Dutch coast. Away from the white sands, Katwijk’s yachting marina is on a narrow, shallow branch of the Rhine. It flows from Leyden through the ancient village of Rijnsburg where Spinoza, the Jewish philosopher, lived. His family had been expelled from Portugal about the same time as the persecuted Pilgrim Fathers fled via Hull to Holland before going on to America in 1620. They dwelt in Leyden’s oldest building, whose 12 other museums include yet a third preserved home – the miller’s rooms inside the Falcon. One of Europe’s oldest botanical centres is also in Leyden, where the first tulip was imported from Turkey in 1593. 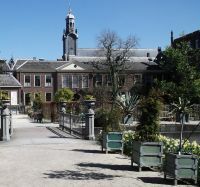 This garden belongs to Holland’s oldest university. Famous for its medical faculty and anatomical theatre, it also teaches aerospace law, since the European Space Research & Technology Centre (ESTEC) is just outside Katwijk, while the headquarters of Airbus Group is in Leyden. 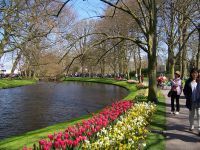 Buses go to Keukenhof, whose 79 acres are a showcase for 100 growers of 7m bulbs. There are 800 varieties of tulips whose display is complemented by daffodils, hyacinths and orchids as well as carnations. Other blooms include 15,000 lilies of 300 types. Rows of tulips and other blooms cover the surrounding 77sq miles. Four billion bulbs are planted yearly, half being grown into cut flowers, but the Dutch share of floriculture, worth US$20bn, has declined from 60% to 48% since the millennium. For example, its share of the Japanese market has shrunk from 8% to 2%, yet Israel now ships 300 containers of flowers to Europe each year, while Colombia sends 700 to Britain alone. Cargolux, however, still flies cut flowers from nearby Schiphol, especially to America. An offshoot of Luxair, it is Europe’s largest cargo-only carrier, with B747-400s that fly to 55 airports. 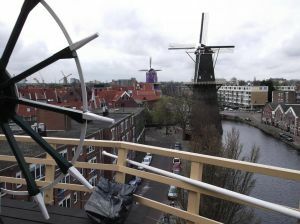 South of Leyden lies Schiedam, whose five windmills are the world’s highest, led by the North one at almost 27m. There used to be 20, most of which ground corn for 188 local distilleries, whereas only 60 survive nationwide, and their 25% share of the spirits market is expected to halve by 2019. An explanation of the processing is inside the rebuilt Palm-tree mill, while the Whale, built in 1794, has a shop selling flour, sugar and spices. Almost opposite, across the Schie River, is a museum belonging to the Melchers distillery, where you can watch mashing and taste a dram of Dutch gin (40% proof). Holland can be reached by either rail or air, but there is an alternative for travellers to avoid possible trouble at Calais and Brussels plus constant engineering works on Dutch Railways. And flying between London and Schiphol (which has an aviation museum) involves six hours’ waiting altogether, due to security. Virgin East Coast trains from London (King’s Cross) take about 2½ hours to Hull, where a luxurious P&O car-ferry with 546 cabins and suites goes overnight to Europoort. Facilities include bars, restaurants and a business lounge as well as transfers. Anyone wanting to bring the family while doing business in Rotterdam or Amsterdam could well stay in Rijnsburg at the upmarket Vakantiepark Koningshof that has holiday chalets as well as pitches regularly booked by the Caravan Club. Besides the customary facilities, there is wi-fi as well as a bar and restaurant. The owner, Philip Kromhout, also runs a conference centre for 150 at Katwijk.